Don't worry, guys. This was pretty much a test. I'll move all the posts back to here when I get back. @Jacoby_Elderfun1 why would you do this... look at what has happened to TAYW. How is there only 12 posts here?? Jacoby moved everything to the first talk all you want. Oh... why does he need to test? If it’s more practical than what we have been doing then he will keep doing it, i think... it’s kind of confusing. It’s really hard to find a post if I am looking for it now. I agree with... Well... I understand @Jacoby_Elderfun1's reasoning, but shouldn't you have asked the other moderators about it first? I mean, this is TAYWII here... I understand completely that this is a test, but, uhhhh... Yeah. Okay. I'm done now. Well, I don't know about asking the other moderators first. It's clearly in his power to revert any changes, so there's really no need to ask the other moderators. It's clearly in his power to revert any changes, so there's really no need to ask the other moderators. wait, WHAT HAPPENED TO TAYW 2? WHAT HAPPENED TO ALL THE POSTS?! @Jacoby_Elderfun1?? WHAT HAPPENED TO TAYW 2? We are now able to limit TAYW to only 2 topics. All we have to do is move all the posts from here to the original when this topic fills up. Plus, we can do it without deleting any posts. 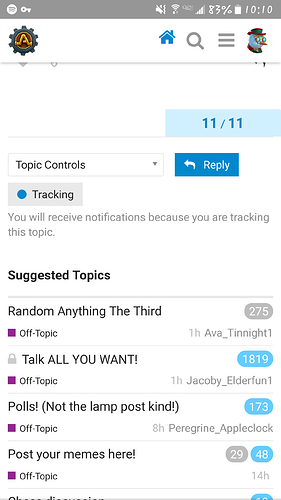 what if someone wanted to find something someone else posted, and get lost in the horrific amount of posts in TAYW 1? @Jacoby_Elderfun1 I thought there was a ten-thousand-post limit. Isn't the original TAYW full?? Yes but he moved the posts here over to there and beat the system.